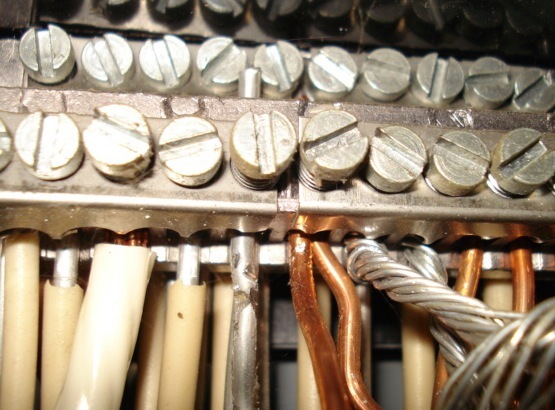 In residential electrical systems, single strand aluminum wiring was often substituted for copper wiring between approximately 1965 and 1973, due to the rising costs of copper as supplies were directed towards the Vietnam war effort and production of munitions. After approximately a decade of use it was discovered that there were several weaknesses in this material and application resulting in poor connections, which leads to overheating and the risk of fire. Aluminum has a higher electrical resistance than copper which means to provide the same “flow” at a given amperage, aluminum conductors must be larger in diameter. It is less ductile than copper and more prone to fatigue failures from repeated bending which can cause damage to the conductor internally, resulting in increased resistance and overheating. Aluminum is susceptible to galvanic corrosion when in contact with dissimilar metals and it produces an oxide coating on the surface which can deteriorate connection and present a fire hazard. Aluminum also expands and contracts significantly due to thermal variations which can cause connections to loosen over time. New aluminum wiring types have since been introduced that are not subject to the same disadvantages. However, if your home does have older single strand aluminum wiring, several options exist for correction, including rewiring the home with copper wiring, or by using copalum crimp connectors to pigtail copper wires at all wiring terminations. While very effective, they can be costly (roughly $50 per switch, light fixture, outlet and every connection in the service panel). Several other methods exist but are not recommended as permanent repairs by the Consumer Product Safety Commission. In Florida, the presence of single strand aluminum wiring may limit the available options for homeowner’s insurance until it has been replaced or repaired by a licensed electrical contractor. If you are uncertain or concerned about the condition of your home’s electrical system, contact us today to schedule your home inspection.